This is MY journey with MS! I give you my thoughts, feelings, hopes, and prayers. My wish that one day this disease will come to an end. That one day there will be a cure. For now, I hold on to possibility. I HOPE this will help and inspire not only myself but others. For the latest News, Weather, & More.....keep scrolling! It was Michaels first week on the job. After 18 years at Prudential Securities in New York City, he quit and took a trading job at a Cantor Fitzgerald office near his Rumson, N.J. home so he could convert commuter time into family time. 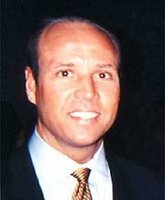 He was temporarily stationed at the Cantor Fitzgerald office on the 104th floor of the World Trade Center while awaiting the opening of their new office located in Shrewsbury, N.J. He was only supposed to be at the WTC office for a month. He decided to take the summer off so he could spend it with his wife, Lynn, and their three children. There were lazy days at the Jersey Shore, barbecues, and swimming. There was a glorious late-summer stay at a rented house in Provence with his best friend of 40 years and their wives. Michael was an unpretentious man with a ready laugh, happy in his own skin according to family and friends. He was a big guy, strong enough to rescue several people over the years from the surf. "We sort of thought that if anybody could come out of this, Mike could," said his sister Mary Ellen McCabe. Michael, 42 was "a good friend, a great husband and a wonderful father," said McCabe's brother Nick. He was married and had three children, two girls and a boy. He was born and bred in New Jersey and graduated from Rutgers University. "We're right on the Jersey shore," Nick said. "He loved getting into the water and surfing. It was one of his biggest activities." More than 3,000 people attended the memorial service for Michael McCabe at the beach club. "It was a beautiful day to remember him by," Nick said. Information courtesy of the New York Times/Chicago Tribune. 2,996 is a tribute to the victims of 9/11. 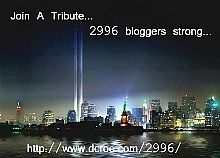 On September 11, 2006, 2,996 volunteer bloggers have joined together for a tribute to the victims of 9/11. Each person paying tribute to a single victim. We honor them by remembering their lives, not their murderers. For more information and a list of the tributes, click here. I will never forget the morning of September 11, 2001. At the time I was working in the Division of Pediatric Nephrology at the U of U in Salt Lake City. My scheduled time to be at work was 7:30 a.m. I remember walking through the rehab department (as usual) where the TV was on. The news was on and there were people watching it (but this was also typical). I did not pay much attention and continued on to my office. It was not until my co-workers started to arrive around 8-8:30 that I found out anything was happening. Adria came in and said have you heard the news, someone flew a plane into the World Trade Center in New York. Immediately we pulled up MSNBC.com and started watching the coverage. The rest of the day the group of us huddled around our computers and watched the coverage, speechless, sad, trying to focus every time the phone rang or there was something that HAD to be done....on this day the rest really could wait. I don't believe we accomplished much of anything that day. I remember that afternoon and over the next week there was increased security on campus as someone called in a threat on campus...others were protesting....there were questions in regards to some possible involvement of a man from the Ogden area (I don't believe anything came from that). The rest of the week we continued to listen to the coverage as we resumed doing our jobs. I remember going home that night and my son asking what happened and trying to explain to him in a way that he would still feel safe. I will never forget that horrible day where so many innocent people lost their lives. I will continue to remember that day. I will remember the families who have lost loved ones and keep them in my prayers. I will remember all of the emergency workers and all the people who traveled to New York to helped out. I will remember all of the victims who gave their lives bringing down Flight 93 so that the terrorists could not crash that plane into the White House. Everyone one of these people are heroes in my eyes. Today I am honored to tribute Michael J. McCabe and all of the victims of 9/11. What a great tribute you've written. I would have loved getting to know Michael McCabe and I'm sure my husband and he would have been great friends if they would have known one another. He sounds like the perfect family man, and oh what a shame it is that his family is forced to go on without him. What a loss!!!! Thanks for sharing what you did....I'm in awe of what you've written! It is wonderful to think that this helped to honor him in a respectful way. When I heard of this memorial through bloggers I was saddened to remember of all the people who lost a loved one, but happy to be able to honor such a wonderful man. My thoughts and prayers continue to be with his family and all of the victims families from this tragic day. I was diagnosed with MS in 2004, have been through all of the FDA approved treatments I qualify for and now am participating in the HALT MS Study. This is my story...my life with MS (among other things). Click to Contact Me Now! Every time you use your Windows Live Messenger, Microsoft will donate to the National MS Society! Allison Shaddy: MS & Your Feelings!